The first Fourth of July celebration occurred on July 4, 1777 at the City Tavern in Philadelphia, when members of the Continental Congress gathered to mark the one-year anniversary of the signing of the Declaration of Independence. 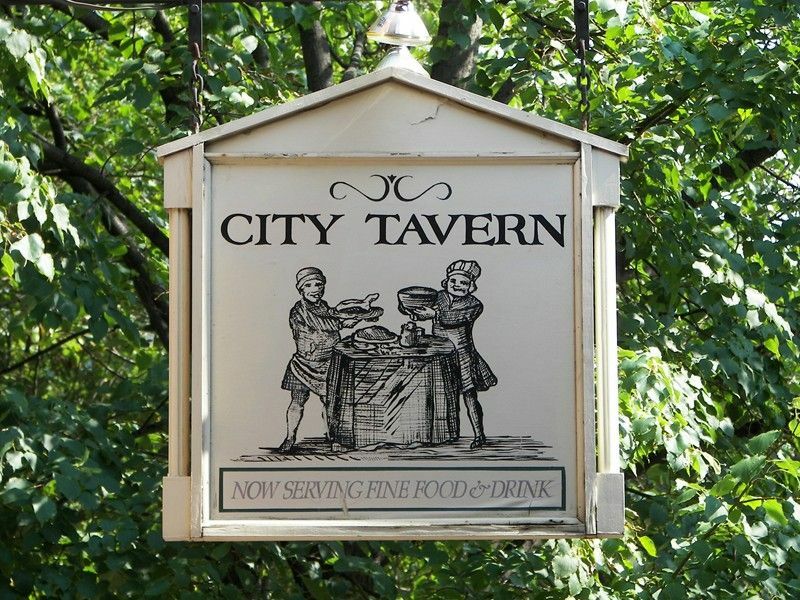 "The Tavern was built 'for the convenience and credit of the city' by a group of eminent Philadelphians who felt that their hometown deserved a fine tavern which reflected its status as the largest, most cosmopolitan city in British North America... "
Because leaders of our fledgling nation were dining at one of Philadelphia's best public houses, the first meal marking the birth of the United States was elaborate and of the finest ingredients. 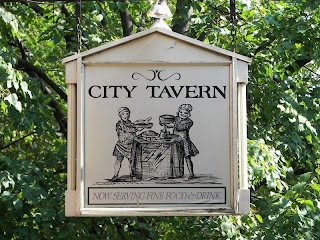 "Current tavern chef Walter Staib says the menu likely was based on the recipes of the British culinary authority Hannah Glasse,whose book 'The Art of Cookery Made Plain and Easy' dictates not only every dish of the three-course dinner, but where it should be placed on the table. 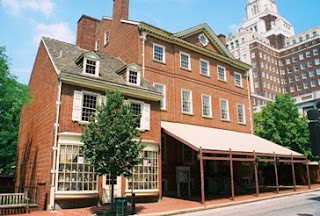 "Glasse’s July menu suggests the signers of the Declaration would have supped on roast turkey and fricasseed rabbit, pigeon, crayfish and lobsters. There would have been tongue and turnips and lamb testicles. And for dessert, apricot tarts and roasted apples, plums, jellies and custards. "Every year Dorothy Batchelder, whose father's family settled in Massachusetts in the 1600's and whose mother traces her family's arrival in this country to the Mayflower, eats poached salmon, peas and new potatoes and strawberry shortcake on the Fourth of July. "Now that Ms. Batchelder owns a shop called the Fishmonger in Cambridge, she poaches the salmon there, just as she does for her customers, and takes it to her mother's house in Beverly Farms where there are always about 20 people for lunch. In the 21st century, Americans greet Fourth of July not with culinary elegance or the finest, first-fruits ingredients, but with unhealthy fake-foods hawked by corporations... hot dogs made with scraps and mystery meats, hamburgers dripping with Kraft "cheese" products, weirdly-flavored potato chips, and industrial ice creams laden with chemicals, emulsifiers, additives, and artificial colors and flavors. My pipe-dream is that someday, 21st-century Americans will respect our nation's history and culinary heritage, and their health, enough to commemorate the Fourth of July with glorious, homemade meals of the finest meats, breads, produce, and dairy.... including a return to drop-dead delicious homemade ice cream. I'm just saying... wouldn't that be a grand birthday party for America?